The following diagram shows the classes defined in this Management Pack. The following table describes the classes defined in this Management Pack. 6to4 (RFC 3056) is an IPv6 transition technology that provides IPv6 connectivity across the IPv4 Internet for hosts or sites that have a public IPv4 address. Built-in Forefront UAG application accessible to clients via Forefront UAG trunks. DirectAccess is an optional feature of Windows Server 2008 R2 that will host, manage, and either terminate or pass-through IPsec sessions. DNS64 complements a NAT64 deployment by translating IPv4 DNS responses to IPv6 DNS responses according to a predefined NAT64 prefix. 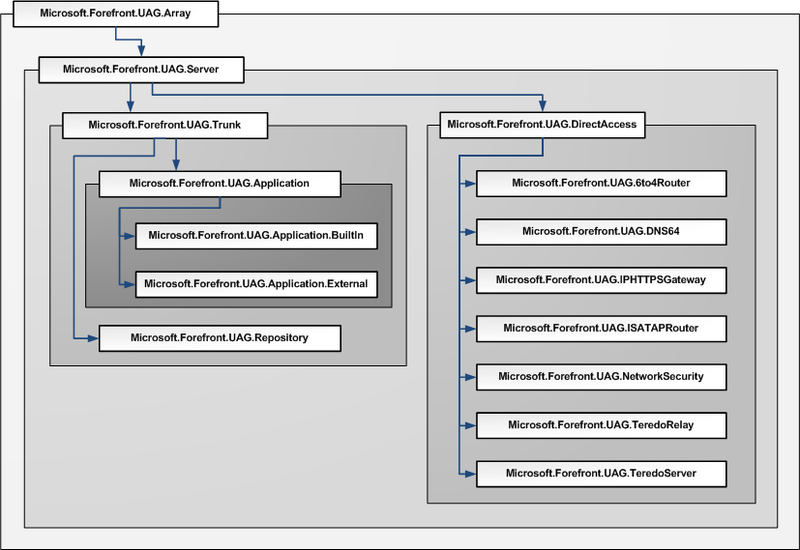 External Forefront UAG application accessible to clients via Forefront UAG trunks. A Forefront UAG application accessible to clients via Forefront UAG trunks. A Forefront UAG array logically groups one or more Forefront UAG servers under one array manager server. A Forefront UAG repository holds information used to authenticate users accessing Forefront UAG portals. A Forefront UAG server represents an installation of Forefront UAG on a server machine. A Forefront UAG trunk groups Forefront UAG applications for publishing with Forefront UAG repositories for authentication. IP-HTTPS is a new protocol for Windows 7 and Windows Server 2008 R2 that allows hosts behind a Web proxy server or firewall to establish connectivity by tunneling IPv6 packets inside an IPv4-based HTTPS session. ISATAP (RFC 4214) is an IPv6 transition technology that is used to provide IPv6 connectivity between IPv6/IPv4 hosts across an IPv4-only intranet. ISATAP can be used for DirectAccess to provide IPv6 connectivity to ISATAP hosts across your intranet. Network security component uses IPsec policies for authentication and encryption of DirectAccess connections. Multiple policies can be applied to a computer simultaneously, each providing a different function. The result of all of these policies working together is a DirectAccess client that can securely communicate with the DirectAccess server and intranet servers. Teredo (RFC 4380) is an IPv6 transition technology that provides IPv6 connectivity across the IPv4 Internet for hosts that are located behind an IPv4 network address translation (NAT) device and are assigned a private IPv4 address.